Our newest family member has arrived last Wednesday. The birth was an amazing experience (more on that later), and I arrived home on a high on Saturday. They say, what goes up must come down. I am definitely down now. I will take some time off, be good to myself and try to shake off the blues. Any advice on that matter is welcome! As for feeling blue – been there… The beginning is always such a blur but one day at a time…, just take one moment at a time. That’s wonderful news Deborah! Congratulations!! She looks simply beautiful. Hope the blues go soon. I think I cried every day for a week in the beginning. Congratulations! She looks so snug and cosy! On the blues – just go with it and take one step at a time. Above all get friends and family to support you with all kinds of things. For me it passed by 6 weeks which sounds a lot but looking back it went so quickly. As to the blues, Be kind to yourself! Fast forward 12 months, all will be settled and wonderful. Stay in your PJs, lean on Big M, eat chocolate, sit on the sofa. Just get through it as best you can. Have a glass of wine…..fine whilst breastfeeding. Congratulations deb, she is a beauty!!!!!! I got through the first few weeks by watching lots of rubbish on tv whilst establishing breastfeeding, eating whatever the hell I wanted, sleeping whenever possible and relying heavily on cbeebies to entertain Elfie! I felt a whole lot better about myself if I managed to get out the house (I found the babybjorn easier for short trips than the pram) and used under eye concealer liberally (still do!!!). For the days when I really needed an extra bit of vavavoom I wore lipstick which weirdly really helps to pick me up. Try to make sure you have as much help and support as possible. And don’t be afraid to go to the doctor’s /midwife if it doesn’t pass soon…. She is lovely! Hang in there! This time of lack of sleep only last so long. Ask others for help. Have them take your older daughter for a couple of hours and make sure you get plenty of sleep. Who cares if the house is clean or even if you make dinner. You can get take out! Just soak in every once of the sweet smelling baby. Ich sende Dir ganz viel Kraft und Liebe. Denke an Dich. I don’t know what happened, my comment is not here! Congratulations!!! Petite Pea is so adorable. Regarding getting through THE down, I haven’t got much to add, but just to say as well take it one day at a time. It is a big readjustment you are going through right now. Not just hormonal but also in terms of family life and routine. I remember that it took me about 6 weeks before feeling normal-ish again after Victor’s birth. Congratulations – she looks a real cutie. The post baby blues are normal, so tell yourself that, and if you want to have a good howl…have one. Better to let it all out than keep it bottled up. Other than that, take things one step at a time, don’t let yourself be overwhelmed by unnecessary visitors if you don’t want them and treat yourself to what you fancy, whether it be a cream cake or a new pair of shoes. What you’ve just done is amazing – and you deserve it! Elle est trop trop trop belle !! fixe toi des tous petits objectifs et surtout essaie de dormir ( pas facile , j´imagine, mais c´est super important de pouvoir te reposer un peu ) et si ca ne va toujours pas, n´hésite pas à aller voir un docteur.. Bon courage !! Tu viens de mettre au monde un bébé, c´est énorme ce qu´il se passe dans ton corps actuellement !!! Je t´embrasse bien fort ainsi que toute ta petie famille !! Congrats on the arrival of your gorgeous little baby girl :-). Congrats to your wonderful little cute girl!!! On the blues – been there too. Take one step at the time, it will pass. Try to get some fresh air if you can, have some Roobios tea (works wonders for me and is ok when you breastfeed). Listen to your favourite music and don’t push yourself too hard. Sleep lots, be kind to yourself, deep breathing, talk to a friend over tea and cake… it will pass. And (as Nappy Valley Girl says) if it doesn’t, then ask for advice. Ohmygoodness==she is absolutely beautiful!!!!!!!!!!!!!!! Congrats! Btw, I hated the immediate post-partum period with both of my kids. Have a glass of wine when it gets bad:). Congratulations et bienvenue Petite Pea! What a beautiful baby. When having the baby blues I’d find really sad films that way I could indulge in a good weep. Remember baby blues are hormones, they’re not *you*. The things that help reduce the blues are things that affect hormones, like brazil nuts for the selenium (try chocolate covered ones, yum! ), at least 20 minutes daylight each day, plenty of sleep (which usually means asking for help so you can), and tears if you feel like it. Did you know there’s something like 6 different types of tears all based on what chemicals they contain? We need to cry so we can get the chemicals out of our systems, which is why ‘after a good cry’ we usually feel better. Each of these things may help a little. Oh, and patience. But that’s a tough one. Congratulations! What a perfect little face! What a wee darling. I love them at that age, they are like creatures from another more perfect land. Congratulations, welcome to the world little one. That was supposed to say ‘what’ a beautiful baby…! What a beautiful baby! Congratulations from Barcelona. What a little doll!! Congratulations!! Many congratulations on your little bundle of joy wishing her a lifetime of happiness and health. Just be kind to yourself and do not try to do everything. So glad that you had a positive birth experience this time…unlike your last experience. 1. From 4pm to 7pm are the hardest part of the day – you’ve been up for ages and your first born is tired too. Make sure you eat carbs to keep energy up at that time of day! 2. Trying to make everything cheerful for the sake of the first child is exhausting. I was very keen not to appear blue, even though I really was. I was reminded that every family has some times of futility and arguing and snapping and that is normal. My efforts to keep it all on an even keel were in vain. It was important that my first born saw that things were hard for me – after all, we are only human. 3. It’s all a phase…everything in parenthood is! It becomes even more evident when there are more children to deal with! Congrats, she looks so sweet and serene! As I just lived through what seemed an endless ONE week of baby-blues, I can only tell you what helped me. Endless cuddling with my baby-girl in our huge bed, loads and loads of tears if I felt like it and many cups of intense hot chocolate and “Leibnitz”. Hoping that you fell well soon. Take care! Enjoy those early days. Stay in your PJ’s. Go for walks if you feel up to it – fresh air to blow the blues away! She looks perfect, well done. So glad it was a better experience second time around. I bet little L is a proud older sister! So glad you had a good experience this time – you deserved it after your last birth. Many many many congratulations on your new born baby! Cherish every moment and take lots of pictures! 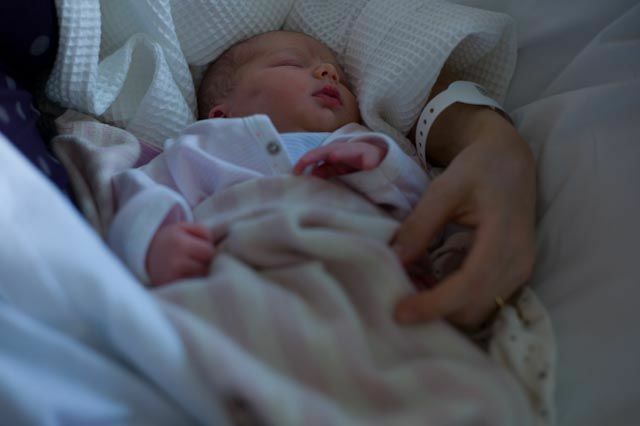 It’s going to be much harder to have naps with your baby this time round so accept as much help as you are offered and don’t worry about this new dimension to your family. Everything will settle down and everything will be perfect and you will never be able to imagine life without your little baby. Well done & congrats, hope your back on a high soon.